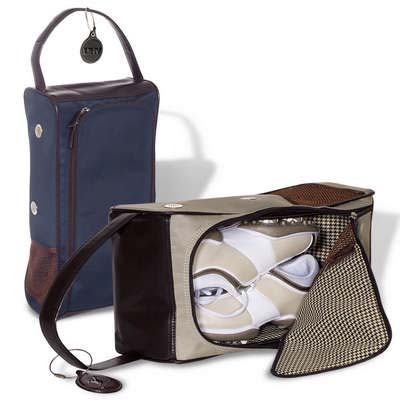 The Woodbury™ Golf Shoe Carrying Case is unique in its styling and purpose. 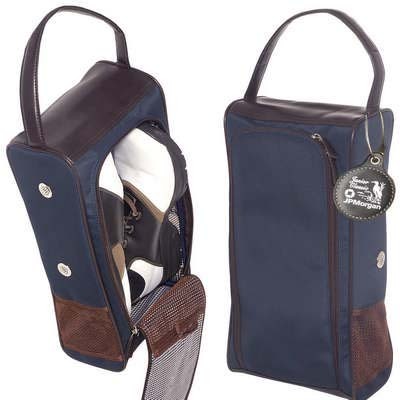 With your logo neatly imprinted on these, your high net worth customers are bound to remember you with your brand name reaching to all individuals in the top management who finalize millions of dollars worth of business while on the golf course with their peers. Imprint Area : 1.125" sq. The Woodbury™ Golf Shoe Carrying Case is unique in its styling and purpose. With your logo neatly imprinted on these, your high net worth customers are bound to remember you with your brand name reaching to all individuals in the top management who finalize millions of dollars worth of business while on the golf course with their peers. 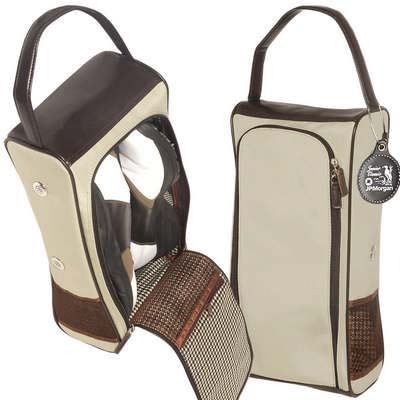 Available in the classic Taupe/Cocoa, Admiral Blue/Cocoa colour options, the design carefully incorporates mesh pockets and metal vents for air circulation while the microfiber with simulated leather trim and houndstooth lining adds to its elegance and stylized looks.